CD review: "Live at the Greek"
This review first appeared in the September 9, 1994 issue of the North County Blade-Citizen (now North County Times). 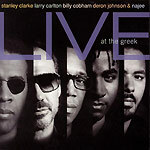 This unlikely coupling of hard-fusion players Stanley Clarke (bass) and Billy Cobham (drums) with smooth jazz pop instrumentalists Larry Carlton (guitar) and Najee (saxophones) yields a surprisingly balanced and artistic performance. They turn in a powerhouse cover of the Doobie Brothers "Minute by Minute" with Najee laying down an unanticipatedly soulful lead on alto sax. Keyboardist Deron Johnson almost perfectly captures the original lead riff on synth, and with a rhythm section of Cobham and Clarke, you know the backbeat will swing. But this short-lived combo also tackles some heavier jazz material, such as "All Blues" by Miles Davis and Mingus' "Goodbye Pork Pie Hat"  and succeed better than most jazz fans might have guessed. (Check out Najee's superb flute lead on "All Blues"  who would have guessed he had it in him from listening to his solo releases?) Also featured is Clarke's signature song, "School Days," given a nice reading by the quintet. This is both accessible and artistically challenging, and is a testament to leader Clarke for his willingness to combine musicians from different backgrounds and make it work.